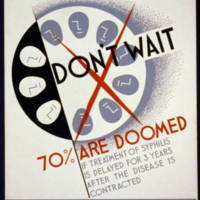 The overarching principle of the PHS’s program to control venereal disease was to “break the chain of infection.” The focus was on identifying those who had syphilis through widespread testing and contact tracing and then “chemically quarantining” patients via treatment that cured them (or at the very least rendered them noninfectious). This emphasis was a contrast from earlier efforts that focused primarily on testing specific groups of people though likely to have syphilis and often physically quarantining them through the process of rendering them noninfectious. 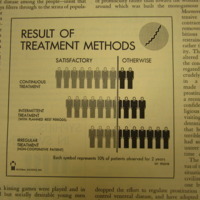 Educating the public about the seriousness of syphilis and gonorrhea and familiarizing them with the tenets of the control program were also important in order to gain support and participation. A lack of understanding or fear about the discomfort, side effects, effectiveness and accuracy of testing and treatment were believed to be roadblocks to people following through with an adequate treatment regimen or seeking out care at all. 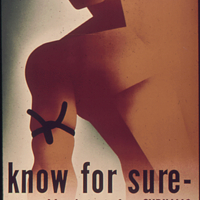 The anti-VD campaign tried to promote a clearer and more positive understanding of control measures among the public in pamphlets, posters and films that detailed each step in the program. Materials addressing testing focused on how easily blood tests (Wassermann) and darkfield exams were interpreted by physicians. Materials explained how a one could identify a sample with syphilis after the Wassermann test was performed on a sample—a cloudy or milky solution showed the presence of spirochetes, a clear solution meant the patient was syphilis free (top right). Many images also showed technicians looking through microscopes and identifying the corkscrew-shaped spirochetes in a sample positive for the illness. 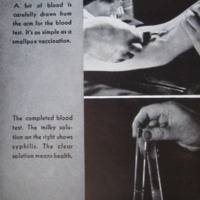 VD films in the 1930s and 1940s often used the trope of a physician showing a resistant patient the germs in their own sample to convince them they had syphilis or gonorrhea. Materials on treatment explained what the therapeutic procedures were and the importance of getting early and adequate treatment from a physician (not a quack). This second component was a very important principle of the PHS’s control program. 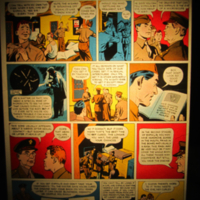 Curing or rendering cases noninfectious via treatment was the main method of preventing the spread of disease because the campaign focused little on prevention via prophylaxis (condoms or chemical methods). 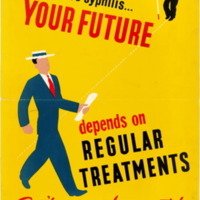 While this principle was not new, the length of time and regularity required to complete treatment had made achieving this difficult in practice, and studies had shown that most people who tested positive for syphilis were in the later stages of the disease when lengthier and less standardized treatment was necessary. Therefore, hammering home the early and adequate message was important to improving the effectiveness of the public health program.